YORKSHIRE will be battered by Storm Barbara just as the Christmas weekend begins, forecasters said today. Gusts of up to 70mph will batter the county from noon on Friday, as many workers leave for their Christmas break, and continue through the holiday weekend, the Met Office said. A spell of very strong south to southwesterly winds is expected to develop on Friday. Gusts of 60 to 70 mph are likely quite widely, before moderating on Saturday morning but then freshening up again later. 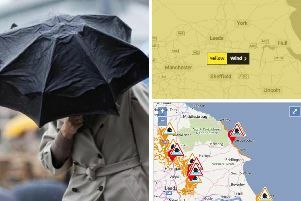 Forecasters warned of possible structural damage, as well as disruption to power supplies and travel. A further spell of very strong southwesterly winds is expected on Christmas Day. Met Office spokesman Grahame Madge said: “We are expecting gusts of around 80mph widespread within the amber warning area, up to 90mph in places. “We have had the good fortune to be able to issue the weather warnings ahead of Storm Barbara coming, with plenty of time hopefully for people to change their plans if they need to. The UK Coastguard issued its own safety warnings ahead of the weekend. Coastal operations area commander Ross Greenhill said: “We always advise people to check the weather and tidal conditions before they set out so that they can either prepare accordingly or consider whether they should even be going out at all. Storm Barbara has been named in line with the Met Office’s alphabetical policy for the strongest weather systems and is only the second name designated this season, which began on October 1, after Storm Angus. Meanwhile, flights from three London airports were hit by delays this morning after fog shrouded the capital. Festive travel plans faced being thrown into chaos after Heathrow, Gatwick and London City Airport all experienced a raft of hold-ups due to the weather. A spokesman for Heathrow said some early-morning flights had been pushed back and there could be knock-on delays throughout the day, but added that there have yet to be any cancellations. British Airways said on its official Twitter feed that it was aware of fog affecting flights at all three London airports and advised passengers to check their flight status online. One flight due to arrive at Gatwick at 11.20pm on Wednesday was diverted to Birmingham Airport because of the fog. Mark Culverhouse, who was travelling with a group of 17 friends and family from Fuerteventura in the Canary Islands, said the flight landed at around 1am before they were taken by coach to Gatwick and arrived just before 5am. He finally got home at around 7am - six hours later than anticipated. Mr Culverhouse, 46, from Liphook, Hampshire, said: “The captain announced over the speaker that main runway was shut for construction and the support runway was not suitable because of the weather. “It stressed us all out a bit as we were not sure what was happening until we landed. “The captain then said they were going to refuel and retry for Gatwick as the weather had eased, so we sat on the plane for a bit, then he announced they could not get fuel so we would have to leave the plane and transportation to Gatwick would be arranged.